A trip to Capitol Hill. A conversation with Alan Greenspan. Another Virtual Meetup. Elastos is finding its way to the center and everywhere in between. Nelson Mandela said, “Education is the most powerful weapon which you can use to change the world.” He knew about changing the world. But what kind of education are we talking about? 10. The mobile terminal wallet HD solution discusses the definition of private key and class hierarchy, CAR interface. • Elastos will attend the 2018 China Joy– China Digital Entertainment Expo and Conference (http://2018-en.chinajoy.net/). Elastos will have an exhibition at the BTOB area. More information to come on what Elastos will showcase for the future of blockchain and gaming at the expo. Rong Chen, a senior member of Tsinghua Entrepreneur and Executive Club (TEEC), was given the Best Achievement Award for the year of 2017–2018 at the TEEC Xi’an annual meeting. Elastos team representative Yuxin Zhang introduced the development history and design philosophy of Elastos at the “519 Developers Meetup”. The presentation from Zhang caught the attention from the game developers who attended. Qi Dian Consulting hosted a Blockchain Development Summit in Toronto with Elastos and Fresco. 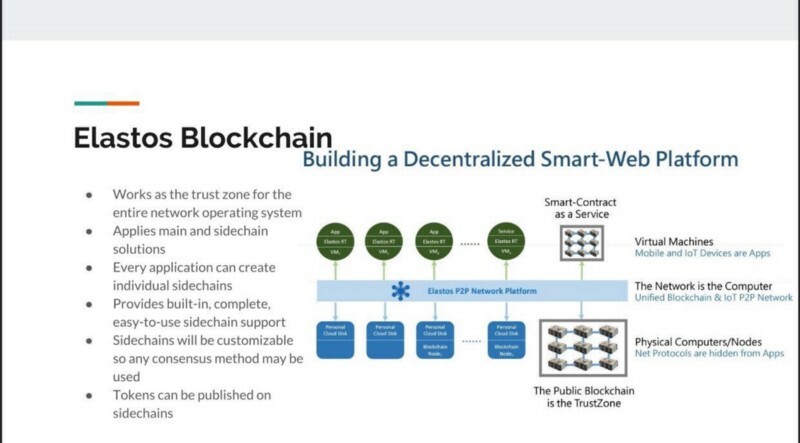 Feng Han gave a presentation on Elastos. Elastos hosted a Hangzhou Meetup. Team member Feng Zhu shared the project background, introduced the Elastos cloud infrastructure, and spoke about the Dec. 2017 to Dec.2018 roadmap. Elastos Hosted a Virtual Meetup. 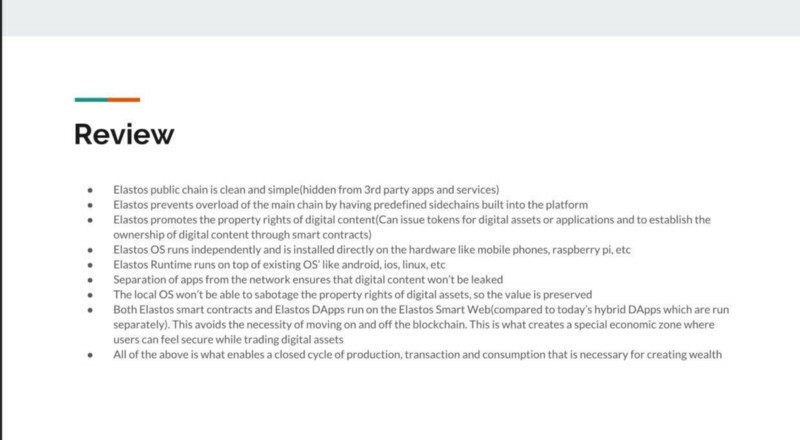 Elastos held its second virtual meetup on Thursday afternoon. The main subject of the meetup was an Introduction to the Elastos Platform. 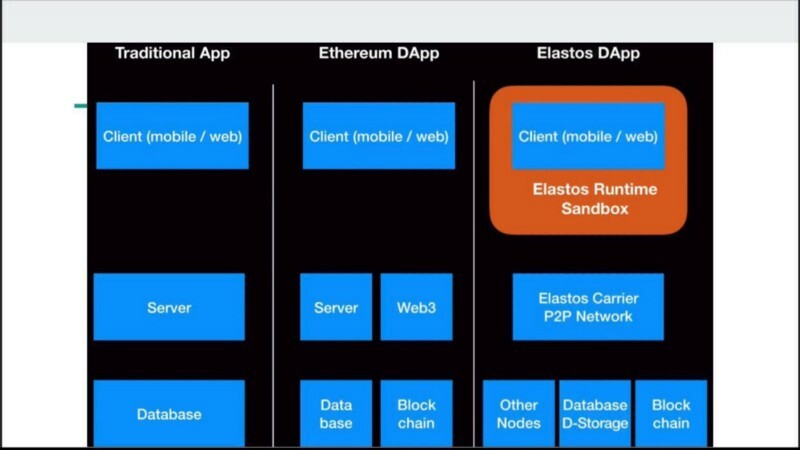 KP Woods gave an overview of the platform including a comparison of a traditional app verses an Ethereum dapp verses an Elastos dapp. Clarence Lui gave a review of the Bounty Program and talked about how to become a community leader and info on organizing future meetups. Kevin Zhang attended and answered community questions. 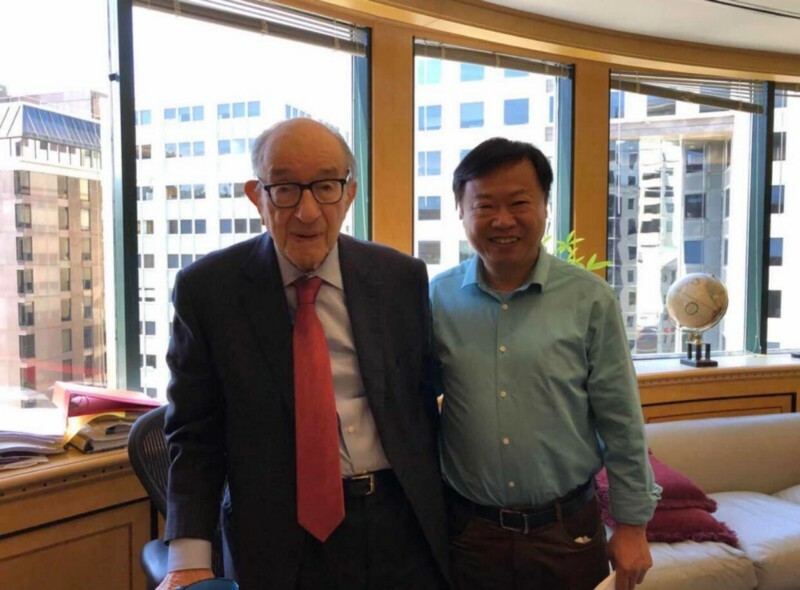 Feng Han met with Alan Greenspan on Thursday to discuss gold, fiat money, and Bitcoin. Mr. Greenspan is the former Chairman of the Federal Reserve of the United States from 1987–2006. Mr. Greenspan spoke about how in the absence of the gold standard, the issuing and inflation of fiat money has hurt wealth and savings worldwide. Feng Han spoke about the value of Bitcoin. He presented the case that Bitcoin is like digital gold because of its scarcity, distributed existence, and the work required to mine it. Today marks a day that may be remembered as a historic turning point in internet history. On May 25th, 2018, the General Data Protection Regulation (GDPR) goes into effect in 28 nations in the European Union. The GDPR is a law that aims to protect the more than 500 million citizens of the EU online when it comes to their data privacy. It allows citizens to request easy to understand documents about what information companies hold about them and allows citizens to request the information be restricted or deleted. Internet giants, retailers, banks, even grocery stores must comply with this transparency-centric law, the most dramatic data privacy law anywhere in the world. Citizens can now also download their data and take it with them to a competitor. You could leave one bank for another, or leave one streaming service for a rival, bringing your data along. You may have received one or more emails recently from a company ensuring you that they will protect your data and want you to continue trusting them with it. These emails are in compliance with the new law, and companies have every reason to comply, as the maximum fine for non-compliance is up to 4% of annual revenue. For a company like Google or Facebook, the fine could be in the billions. The GDPR is a complicated issue, and it will take years to sort out if it’s a positive or less than positive law for individual privacy and protection. It will come down to a combination of how the law is enforced, and how individuals use these protections to their advantage. Many people may simply agree to continue allowing their data to be beyond their control because they feel it is overwhelming, or an inconvenience to try to sort it out. These are legitimate reasons as much of society feels inundated online when agreeing or not agreeing to terms that allow them to access the sites and apps that are now part of their daily lives. It is a sort of panopticon bargain that is made so easily because no other easy to use option exists — or, did not exist. One of the main concerns with the intersection of blockchain data storage and these new privacy laws is that blockchain is immutable. If personal data is stored on a permanent ledger, then a person could not have the information deleted. Is this true for all blockchains? Is it true for Elastos? Before that is answered, it must be said that the real issue, far beyond the what ifs of data and blockchain and government regulations and citizens taking their online rights back, is that most people, including most politicians, do not understand technology. What your data is, how it is stored, how it is shared, what blockchain is, if it is a positive or a negative to this problem, all of these questions are barely understood and even fewer able to be answered by the masses including our democratically elected representatives. What the world needs now, especially The United States, is education on technology. That’s what Elastos intends to do, not try to merely benefit themselves, but educate society on the important technologies they know so little about. Let’s look at data storage on Elastos. On Elastos, a user will receive a decentralized ID issued by the main chain. Data itself will not be stored on the Elastos main chain, but instead, on an inter planetary file system (IPFS) that will be spread across thousands of severs, all encrypted. When someone wants to access this data, the Elastos Carrier, without knowing where the data is stored, will retrieve it. This is decentralization at work. Elastos will not store your personal data. We are merely a platform to write decentralized applications on top of. Each dapp itself will be responsible for being in compliance with whatever data laws apply to them. However, dapps on Elastos will also store data in a decentralized manner. Even if personal data is stored somewhere, the dapps themselves will not control the storage hardware. In addition to all of this, Elastos will let users save their personal data onto their own private cloud storage drive in their home. This is real data privacy. This is real data control. This needs to be taught to the public and the government. Fay Li and Feng Han traveled to Washington DC this week to meet with a politician, Ro Khanna, about this very issue: education. Mr. Khanna has a unique vision for a United States Congressman. At 41 years old, he is young among his peers and this clearly is a strength when it comes to understanding how the internet and the founding principles of American society can intersect in a way that they currently do not. …Sounds like something you could have heard in a past issue of this section. But the parallels continue. Last year Ro co-founded a caucus called the NO PAC Caucus for members of Congress who do not take money from Political Action Committees, and instead, only individual contributions. This ideological step towards removing the centralization of corporate money in our political system is philosophically aligned with Elastos vision of a new internet. Fay Li and Rong Chen met with Ro Khanna in March to discuss educating Congress on blockchain technology, and now, Fay and Feng have met with him again. The idea for the council is to form a group of educational experts and influencers to help educate the public and The United States Congress so that laws and measures can be taken for the success of this technology and the success of the nation. The council aims to include academics from top universities, economists, blockchain research laboratories, tech companies, exchanges, and other experts in the industry. The council also intends to hold international conferences and help facilitate cross-border communications between the US and other governments, starting with politicians in the EU and China. All of these ideas are the beginnings of a wave of national education on blockchain and cryptocurrency that will be fundamental for mass adoption. While there is no guarantee that the US Congress will cooperate, these plans, between Fay and Rep. Khanna, and the eventual members of this council are democracy at work. Citizens with an expertise of national interest forming a council to better society with the help of their democratically elected representative is what makes democracies great. It is also symbolic of what many blockchain projects, including Elastos, are trying to achieve: interconnectivity and cooperation that improves lives. This movement will take leadership — in America and abroad. Here is a statistic to illustrate Ro’s last point. It was recently revealed that Jeff Bezos of Amazon makes more than the yearly median income of his employees every 10 seconds. If Americans want upward mobility, they need to start learning about technology, not necessarily working for the big tech companies, but understanding how they can use it be a part of a globally changing economy. It is imperative for technology insiders to contextualize this movement with the larger course of human history and equally imperative for those who know nothing of technology to learn and do the same. This movement intersects with the arts, with finances, with individual freedom, with infrastructure, with health care, with supply chain management, with globalization, centralization and decentralization, and with the governments who try to craft laws to shape our future. This is a massive international space — and one cannot take a myopic view that merely involves daily fluctuations and speculative predictions. Someone, if not many, need to think about the big picture. The big, big picture. To do that, they need to be educated. Without education, there can be no real progress. Take for example a congressional race in California that has brought this space into the public conversation. Brian Forde, was a senior advisor in the Office of Science and Technology Policy when Barack Obama was president. After his work in the White House he went on to MIT’s Digital Currency Initiative and has been a public advocate for blockchain and cryptocurrency. Forde is now running for a House seat against incumbent Mimi Walters in California’s 45th Congressional District. Here is where it gets interesting. Forde is accepting Bitcoin as campaign donations, a perfectly legal act as deemed by the Federal Election Commission in 2014. However, a fellow Democrat running for the same seat, Dave Min, has run an attack ad directed at his pro-Bitcoin stance. This is a direct example of spreading misinformation about blockchain by a potential congressman trying to win a seat. But what is refreshing about this story is that on the other side is a potential congressman who does understand the technology and believes that the rest of congress should too. Brian Forde is only 38. After working in the Peace Corps in Nicaragua, he saw the high price of phone calls and started one of the largest phone companies in the country, creating a low-cost phone service for 250,000 people. In the White House, he started a tech initiative in 72 communities to train and hire Americans for high-paying tech jobs. We need politicians who understand technology. Europe has data privacy laws. The United Kingdom has launched a Crypto Asset Task Force. America needs an Internet Bill of Rights — and it needs a Blockchain Council. The United States needs to begin to lead on these issues before it falls behind. We need a technologically educated society educated about technology. That includes our schools, it includes our public, and it includes our democratically elected government. One of the issues that all projects face right now is in explaining what they offer to a layman. If we begin to teach our society about what is happening in this space we will be able to lay the foundation for understanding what each project can or cannot offer. Elastos itself is not merely a blockchain project. As Rong says, the blockchain can only do so much. It is the idea of a decentralized and actually safe internet that could have an even bigger impact than blockchain alone. It is a massive idea, and we intend to share it and the vision of the entire blockchain industry, by helping to form a council of the best and the brightest in the space. We must not assume to know everything, but constantly learn, and constantly teach each other. If our governments will not lead, then we must lead for ourselves. Let’s share the knowledge that pays the best interest. Let’s share this knowledge with other Americans and let’s share it with the world. There is a moment here, before the knowledge spreads. In filmmaking, the hour before the sun sets, and the hour after it rises, is called magic hour. Some films spend an entire day preparing for a single shot of that perfect blend of colors in the sky. Almost…alive. The sun is now setting on one era of technology while rising on another. But let’s not bask in this magic hour. Let’s have the audacity to share our knowledge with the world.